With respect to the second article, written by Barbara Boyd, the premise is the British are running a coup operation against anotherPresident of the United States. In the article’s cover photograph we see President Kennedy in the background, behind President Trump. One might infer the author is suggesting President Kennedy was the prior President the British cabal ran a coup operation against. The Globalists had a long-term plan of stripping America of it manufacturing and reducing it to a 3rd world nation by the 21stcentury. JFK would have none of it! 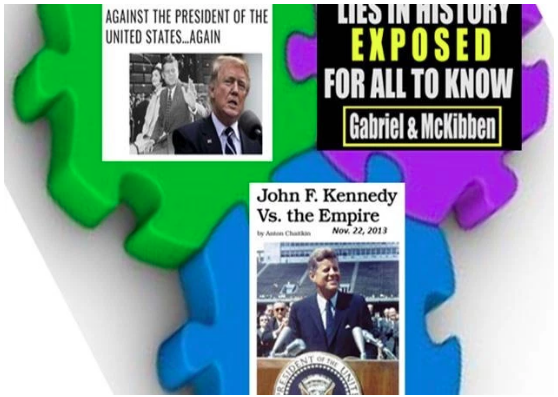 The Kennedy election platform called for a sharp increase in America’s industrial, scientific, and military power, a negotiated peace with the Soviet Union, and the uplifting of mankind out of poverty and war around the world. Dr. Alvin Weinberg became a scientific advisor to JFK thanks to his Thorium (GALT technology). Up until six weeks before his execution, JFK repeatedly mentioned nuclear energy, fueled with Thorium, as the fuel of the future for generating most electricity and lifting humanity up to the heavens.